The heritage of Kutch art and culture is displayed in the Madansihji museum (Aina mahal) Bhuj. The last ruler of Kutch Maharao Madansinhji established the "Maharao of Kutch Aina Mahal Trust on 1st January, 1977. 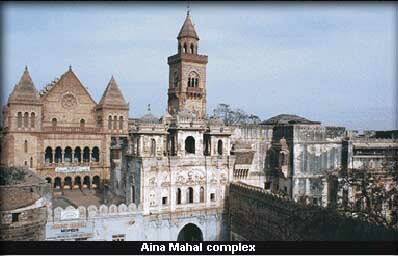 Aina Mahal means a mirror palace. It was created by the artists Ramsinh & Gaidhar Devshi in the period of Maharao Lakhpatji (1752-61). In 1757, Rao Lakhpatji visited the emperor Alamgir in Delhi. He was graced with the title of Mahi Maratib. He welcomed foreigners in his court. Fortune brought him a man named Ramsingh malam who specialized in Kutchi architecture, enamel work, jewellery, tile work and interior decoration. The great master piece of Ramsingh is the Hall of Mirrors in the Aina Mahal. The walls are white marble covered with mirror which are separated by gilded ornaments. The hall is lit by elaborate pendant candelabra with shades of Venetian glass. The hall of mirrors is on the second floor of the Aina Mahal but Ramsingh devised ingenious pumps and siphons to raise up water to fill the pleasure pool and to operate fountains which cast spray in an intricate variety of patterns charming the eye and cooling the air. The small state apartment, carpeted with exquisite Kutchi silk embroidery, its walls paneled high with the same priceless fabrics still contains Maharao Lakhpatji’s bed. The hall is filled with a miscellaneous collection of objects; a Dutch Clock, English and French celestial globes, some antique pictures, mechanical toys, glass and china. On the walls of the corridor are a variety of pictures, some European and many Indian. The Aina Mahal alone cost eight million kories and was only one of the many enterprises which the Maharao and Ramsingh undertook together. 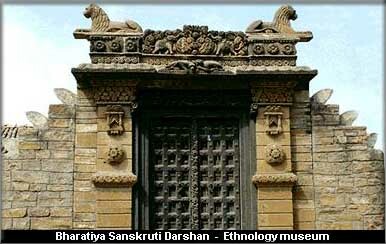 The Kutch Museum at Bhuj initially formed part of the School of Art established by Maharao Khengarji on 1st July, 1877. It is the oldest museum of Gujrat. 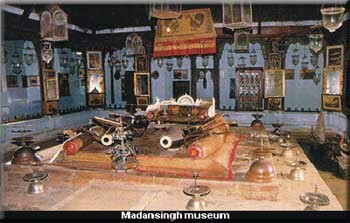 At the time of Maharao Khengarji’s marriage, an exhibition of 5897 items were exhibited and items worth Rs. 3300 were given to the Museum which necessitated the construction of a new building. Accordingly, on 14th November, 1884, the foundation stone for the present museum building was laid. The building consisting of 2 floors cost Rs. 32000. The museum is situated almost on the banks of the beautiful Hamirsar lake and just opposite the Nazar Baugh garden. On the ground floor in the central room is displayed Airavat, an Indian elephant. In 1978 the Govt. of India issued a postal stamp showing Airavat. The museum has the largest collections of Kshatrap inscriptions. It also has a fine collection of Kutch silver, golden and enamelling work, textiles, wood work, coins, old utensils, arms and other archeological objects and a section on the communications of the district. Mr Ramsinhji K Rathod a scholar of the folk art of Kutch and winner of many state Government awards has created an excellent museum in Bhuj which is called Bharatiya Sanskruti Darshan. The museum epitomizes the rustic life styles of the Kutchi villager containing around 4500 exhibits. Also, there are more than 1500 rare books on art and culture. This museum has five major sections. In the Ethnological section, Sahitya Chitra, in the central hall can be found rare works of literature. In other sections are interesting artifacts such as leather embroidery, wood work, wood carvings, terra cotta, wall paintings, bead work, stone carvings, musical instruments, knives and swords and silver work. Inside one of the huts is the intricately designed "Kothala" (the treasury). In olden times, ornaments money, and other valuables of the royalty were kept in the "Kothala".